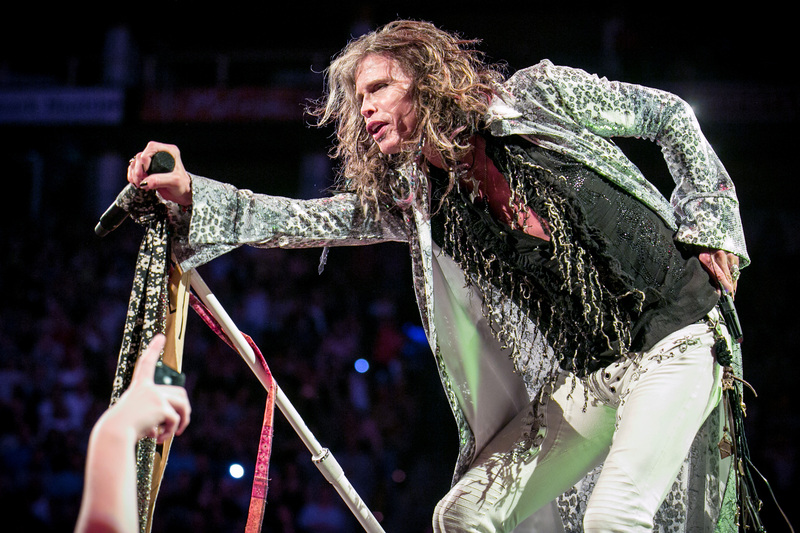 If one were to turn on any radio station in the Boston are this week they would have heard D.J.’s talking about giveaways for the sold out Aerosmith show on Tuesday night at the TD Bank North Garden. In fact most media outfits were buzzing. Local radio station, 107.3 WAAF was even handing out special commemorative bumper stickers. The streets lining the Boston Garden looked very different from when the Celtics and Bruins play there. Instead of the Bruins black and gold, or the Celtics green and white, people were wearing their Aerosmith t-shirts. And at 6:30 PM were waiting patiently for the return home of the Bad Boys from Boston. The show started promptly at 7:30 as Cheap Trick took the stage. They played for an hour, but didn’t get the response from the audience that they clearly deserved until they played their hits. They played a set that included many hits including; “Surrender,” “I Want You to Want Me,” and “The Dream Police.” On the last song, “Goodnight” guitarist, Rick Nielsen brought out his 5 neck, and played it to the audience’s delight. You could tell that anxiety and excitement was building in the Garden after Cheap Trick was finished. You could tell that everyone was anxiously awaiting Aerosmith’s homecoming. Around 9:00PM the house lights went out, and then Aerosmith’s intro tape went on. That’s when the audience jumped to their feet and the band launched into “Draw The Line.” That was quickly followed by the 1989 hit, “Love In an Elevator” which really drew in the crowd, and had them screaming, ‘Oh’ and ‘oh yeah’ during the breaks in the verse. Next up was “Back in The Saddle” which was amazing as Joe Perry was playing his six string bass and Brad Whitford was playing lead. Aerosmith fans are divided into three camps. There are people who like 70’s Aerosmith and hate the rest, or people who love Late 80’/90’s Aerosmith. Then there are the people who like both, which I fall into. So I was excited when they played “Living on The Edge” and “Cryin’” and so were the 90’s Aerosmith fans. They then played “Jaded” which was great and had the audience singing along. Aerosmith then played one of their new songs off the eagerly awaited album, Music From Another Dimension. The song was called “Oh Yeah,” and I was surprised how well it went over with fans. I was also amazed at how well “Legendary Child” came across live, and was even more surprised that people knew the song and were singing along. Next up was a bluesy improvisational number by Whitford who showed his masterful fretwork to the masses. He then launched into the arpeggiated intro to the 1976 jam, “Last Child.” Joey Kramer followed this amazing performance with a stunning drum solo, featuring a spectacular saxophone solo by Mindi Abair. This was followed by the bluesy number “Rag Doll” which featured Perry on lap steel. They then played the instrumental “Boogie Man” which lead into the Joe Perry fronted song, “Combination” from the 1976 album, Rocks. Next up was a real surprise for me with “What it Takes,” but Steven Tyler’s vocal performance was spectacular. The band then played “Legendary Child” as aforementioned this was followed by the classic, “No More, No More” which was spectacular. Perry started off playing his Fender Telecaster, but then halfway through the song he switched over to his ‘Billie’ guitar, all while still having his Telecaster slung behind his back. This is a move that Perry has been doing since the 1970’s, but it still is fresh and looks cool. The band then finished their set with “Sweet Emotion” and “Walk This Way” which were both amazing and got the crowd going again. As the band left the stage, The Garden got dark, and all you could see were the fans lighters and phones waving in the air screaming for an encore. After a short while a piano started to rise from the cat walk, and sitting behind it was Steven Tyler who then launched into “Dream On”. The songs performance was truly amazing, as Perry played his guitar solo on top of the piano. After “Dream On” was finished the band immediately launched into “Train Kept a Rollin’”, and with that the show was over. The Bad Boys from Boston put on a spectacular show that I was thrilled to be at. All the members were on their A-game, and they left everyone in the audience with a great show. Aerosmith’s homecoming was a great success. I fall into the same Aerosmith fan camp as you and this sounds like a fabulous set list. 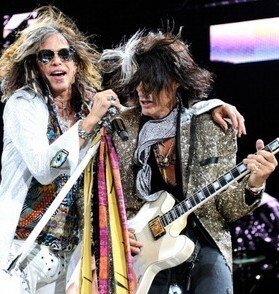 I would adore the opportunity to go and see Aerosmith – hope I someday get the chance! 🙂 Glad you enjoyed!